(CNN) -- Three charges have been filed against a Missouri man who is accused of swimming across a lake and sneaking into the home of Myanmar opposition leader Aung San Suu Kyi while she was under house arrest, a U.S. Embassy official said Friday. 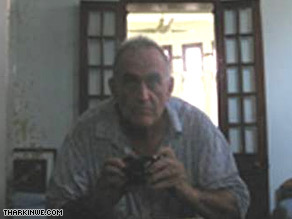 Officials in Myanmar say this self-portrait was found on John Yettaw's digital camera. A hearing for John Yettaw was held Friday at Insein Prison near Yangon, where Suu Kyi also is being held. The official said Yettaw is charged with immigration violations, trespassing into a restrictive area and contributing to Suu Kyi violating the conditions of her house arrest. Yettaw's trial is scheduled for Monday. On Thursday, a spokesman for Suu Kyi's political party said Yettaw was charged with two criminal counts: entering the country illegally and staying at a resident's home without government permission. Both charges would carry a maximum sentence of five years in prison. It was not immediately known why there was a discrepancy in the charges. Yettaw allegedly stayed overnight in the lakeside home, violating the conditions of Suu Kyi's house arrest, according to the country's ruling military junta, which rarely grants her visitors. The 1991 Nobel Peace Prize laureate was subsequently detained. She also faces trial Monday. Yettaw appeared to be healthy and in good spirits, the official said. The central Missouri man was not represented by a lawyer at the hearing, although the official said the embassy has requested one. It was unknown when or whether Yettaw may receive legal representation, he said. Suu Kyi is being held in a specially built area of Insein, the official said. Her trial is expected to last for some time, said Nyan Win, spokesman for Suu Kyi's National League for Democracy. He said she and two of her maids have been detained under Section 22 of the country's legal code, a law against subversion. Suu Kyi, 63, was first detained in 1989 and has been under house arrest for 13 of the past 19 years. The latest extension of her detention was scheduled to expire May 27.